In the cozy 650 sq ft (37 meters) Dolphin Studio you'll enjoy whisper quiet air conditioning with remote control, a large walk in shower in the bath, a king bed with pillow top mattress and Egyptian cotton linens, a full kitchen, a large screen HDTV plus an individual gas barbecue, outdoor dining and chairs to relax and unwind on your private covered lanai. The flooring is polished and stained concrete (cool on the feet).. Kitchen and bath counters are granite. The lanai is cool concrete that overlooks a garden of tropical flowers. 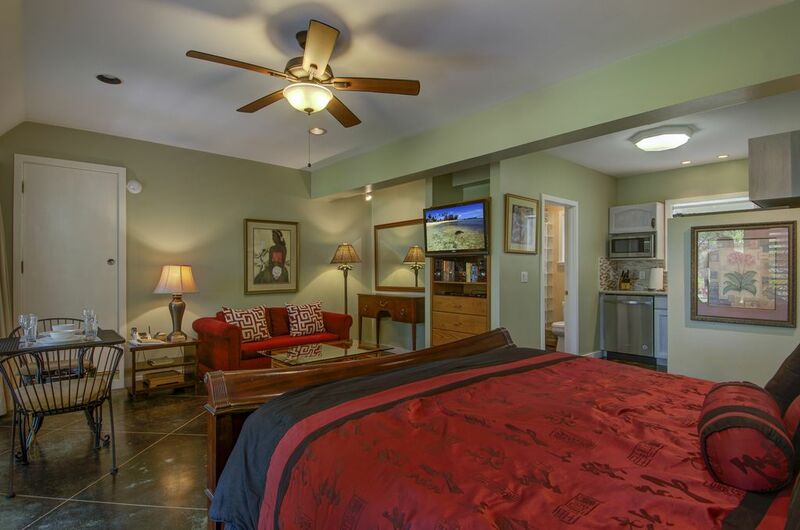 Our guests tell us they also appreciate our off street parking, high speed Wi-Fi property wide, beach chairs, beach towels and coolers, plus the use of a laundry room with detergent and dryer sheets. Our Activity Director Kim will also help you with the many things to see and do on Kauai. All are complimentary. Our three boutique accommodations are located in one spacious buildings on a quarter-acre of lush tropical landscaping a short five-minute walk to Poipu Beach. These photos are of our air conditioned Dolphin Studio. We're conveniently located in the heart of Poipu Beach. Two restaurants, a deli, surf shop and mini market are all within easy walking distance. This is a resort area with many more restaurants, a grocery store and shops located less than a mile away. We have been welcoming guests since 1999 and hope to have the opportunity of meeting you in the not too distant future. Our goal when we started in business in 1999 was to provide accommodations for our guests that had everything we would want if we were traveling. Having done a lot of traveling over the years, we were pretty sure what would be appealing. We set a high standard for cleanliness and upkeep of furniture and fixtures. That meant doing quarterly deep cleans where furniture is pulled away from the walls and cleaned, ceiling fans dusted, air conditioners serviced, carpets and furniture professionally cleaned, windows washed--our check list goes on and on. Unlike the large resorts with multitudes of people, we're located on a dead end street with only three houses beyond us, so very little vehicle traffic. This is a peaceful and quiet location. Although our building has three different accommodations, each one is large and distinct. There are only three streets that have direct access to Poipu Beach and ours is one of them. So, if you're looking for a short walk to what many believe is the best beach on Kauai (and the only one life guarded on the south shore) Hideaway Cove would be the perfect place to stay. Large walk in shower. Granite counter on bathroom vanity. We are a five minute walk to Poipu Beach and Poipu Beach park. There is a delightful view of your own private garden from our Dolphin Studio. For local calls. Use credit card for long distance. Wall mounted with remote controller. Laundry room nearby with detergent provided. Laundry basket in the walk in closet. Laundry room steps from your front door. Detergent and dryer sheets provided. Laundry basket in your closet. Off street parking is complimentary. High speed wireless internet available property wide. It is complimentary. Full sized stainless steel refrigerator with ice maker. Large toaster oven. One of our guests baked a cake in this toaster oven. Also a coffee grinder if you'd like to bring your favorite beans from home. Or try our Kauai Estate Coffee. Many guests really enjoy it. Full set of pots and pans. Full kitchen with granite countertops. Indoor dining table plus outdoor dining on your private covered lanai. Large HDTV can be rotated to face the bed or the couch. How convenient. Leave a book, take a book. Kiahuna and Poipu Bay golf courses are a ten minute drive away.